Hello and welcome to the 345th installment of the SWD. The YPG managed to destroy a Turkish military vehicle on Raju axis, between the villages of Alibiska and Adama. Turkish forces targeted multiple villages today including Tal Rifat, Afrin, Ziyara, Mare, KelJebrin, Murad, and other small populations. Today’s civilian casualties rise to, on the one hand, 11 death and more than 8 wounded by Turkish attacks; on the other hand, 4 civilians have been killed by YPG targeting the recently Olive Branch-captured areas in Afrin. Olive Branch forces captured Tal Dellor, Safra, Rahmaniyah, Ali Jaru and Bulbul. SDF casualties: 177 Kurdish fighters have died. (1892 according to Turkish military). Pro-Rebel and Turkish Army casualties: 1219 casualties. Air strikes and air attacks: 793 attacks targeting populations, infrastructure, schools and water pumping stations. Attack helicopters: 17 helicopter attacks targeting highly populated areas. Artillery and shelling: 2785 attacks. Direct clashes: according to the press release there are 542 known clashes. Shoot down aircraft: the Kurdish forces have been able to shoot down two helicopters, which killed 11 Turkish soldiers and officers; two reconnaissance drones. Destroyed armed vehicles: 66 armoured vehicles, including tanks, four-wheel vehicles and armoured-vehicles; additional 17 vehicles were damaged. Read the full report on this link. Colonel Hassan Ahmed has been killed in Deir Saman in a claimed YPG-SAA operation with an IED. Col. Hassan was head of Sultan Murad’s Military College. According to Sputnik news, YPG agreed to hand over Tel Rifat to the Syrian Arab Army. At the same time, SAA forces -and not IRGC-linked militia- had been spotted heading towards Afrin. Additionally, Russian Military Police was spotted on the road used by SAA heading towards Afrin. Turkish army published a video from a UAV attack on a YPG convoy heading towards Afrin while stationed in the area of Ziyarah military checkpoint. The images show transport vehicles completely destroyed. You can watch the video at this link. Although this news has been published by ANF NEWS, contradictory reports are coming from Sheikh Maqsood neighborhood. 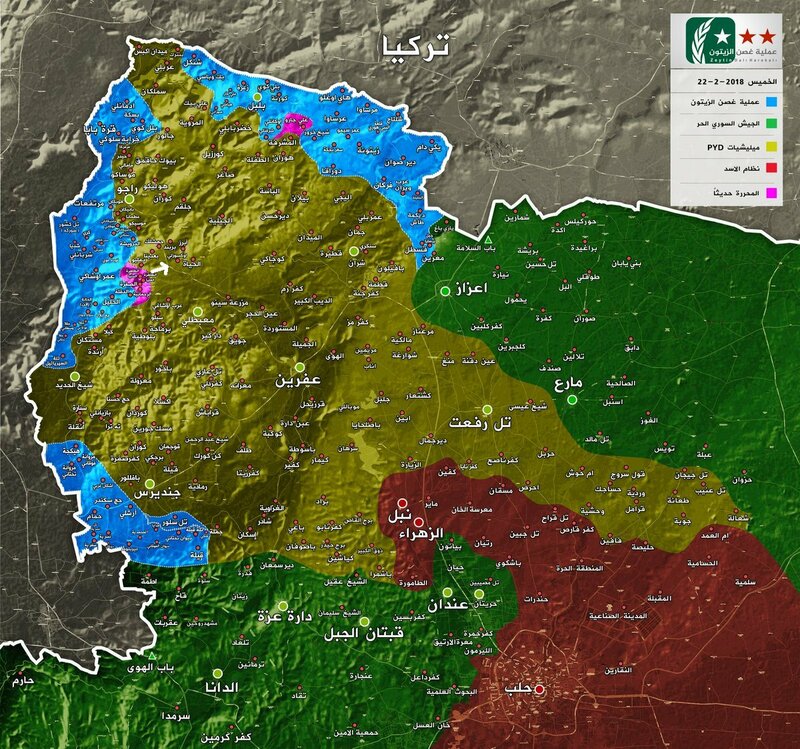 Other reports announce that YPG has retreated from areas captured from pro-rebel militias, being Al Halak, Bani Zaid and Bustan respectively, but not the entire SDF-held areas. Unconfirmed reports suggest that pro-government and government security forces started doing large-scale raids and arrests in the newly controlled districts. The situation escalated between Hayat Tahrir al-Sham and the new Jabhat Tahrir Suriya (JTS). Hayat Tahrir Al-Sham captured Kafar Naha town after clashing for two consecutive days against Al-Zinky -which is a member of the JTS faction- in west Aleppo. Russian and government warplanes targeted the areas of Khan Shaykhun, Ma’arr Shurin, Jisr al-Shaghour, Kafraweid, Taramala and Badama area. Russian aircraft launched multiple airstrikes on the town of Latamna while SAA fired MLRS. Murk and Anakkawi cities were targeted by heavy artillery, too. Government bombing campaign of East Ghouta continued today. Both, the Syrian Air Force and the Russian Air Force have participated in the bombings of Kafr Batna, Saqba, Irbin, Hammuriyah, Misraba, and Duma. According to multiple sources, 46 civilians have lost their lives today. The total death toll from the five-day bombing campaign has reached 403 civilian casualties since Sunday. Multiple barrel bombs and thermobaric bombs had been thrown from helicopters. The city of Duma was targeted by heavy artillery during nighttime. The Non-Governmental Organization Doctors Without Borders (MSF) reported in the past three days up to 13 facilities currently receiving support from the organization were damaged or completely destroyed. Moreover, one of WHO’s clinics has been destroyed, too. Jaish al Islam retaliated government bombings by firing a Zelzal heavy rocket at government positions. The projectile targeted Dumeir Airbase, which is the main base used for the ongoing bombing campaign in East Ghouta. Retaliation targeting Damascus city kills three civilians in government controlled areas. Government forces dropped leaflets on East Ghouta announcing it has established humanitarian crossing points for civilians to leave before the battle begins. Rebel forces targeted the SAA-held Izra town with heavy artillery with unknown results. Government forces retaliated by targeting the towns of Naima, Qum al-Rumman and Da’al with unknown casualties. The Syrian Democratic Forces have captured two SVBIEDs from the Islamic State in Deir ez-Zor area. Additionally, the Germany ISIS member named Dominic R. surrendered himself to YPG forces early this morning. Dominic R. spent more than three years fighting for the terrorist organization before leaving. He joined the Islamic State back in 2014. To know more about his history check this twitter thread by @bjoernstritzel. The Media Center of the Syrian Democratic Forces reported its forces have killed 1776 Daesh members since the beginning of their operations in Deir ez-Zor area. Additionally, the Kurdish forces have destroyed 16 mortars, 17 SVBIEDs, 24 bulldozers, 3 car bomb factories, and many other vehicles. Read the full report on this link. 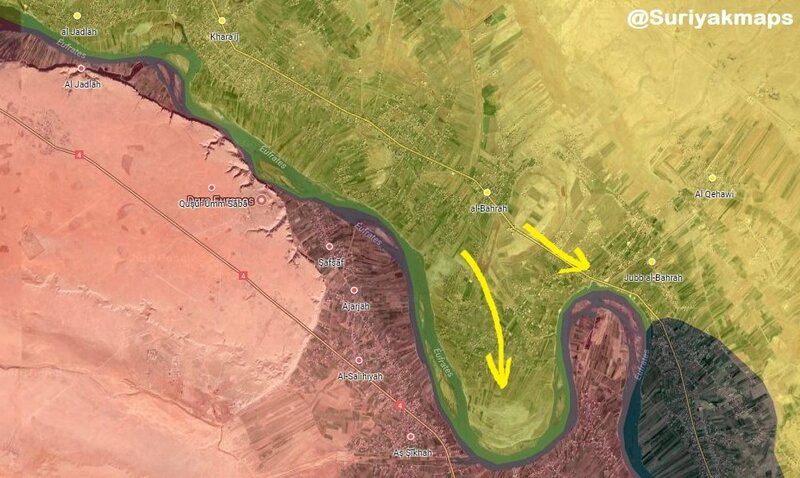 Additionally, SDF completely captured the remaining ISIS-held parts of Al-Bahrah village. Afghan police identified and dismantled a VBIED in Rodat district.